2013 Topps Skylanders Swap Force Dog Tags makes collecting a fashion statement. Aimed primarily at young collectors, dog tags focus on the line of Skylanders figures that allows players to mix and match figures. Each pack comes with one dog tag as well as a chain so that it can be worn as a necklace. Packs are much like trading cards in that you don't know which one you're getting until it's opened. A complete set of 2013 Topps Skylanders Swap Force Dog Tags includes a total of 44 tags. Each focuses on a different basic character or mashed up Swap Force creation. There are no chase tags or parallel versions. Dog tags feature a mix of new core characters, Swap Force Skylanders and a handful of swapped characters showing how they look when they're mixed up. 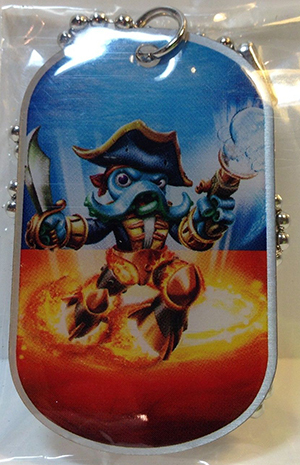 This is the second series of Skylanders dog tags. Skylanders Giants also had a set, which was also released by Topps. Skylanders Swap Force Dog Tags. 20 Packs Unopened.